This is a great summertime dinner and pairs deliciously with a fresh salad and a glass of lemon water. I've even made these into balls and served them as finger foods or appetizers. You can make them ahead of time and put on crumbs and fry right before serving. ~ Cook the peeled potato until tender - boil, steam or microwave depending on your own preference. Drain and mash potato in a medium bowl. ~ Heat 1 tablespoon of the oil in a medium frying pan. Add onion and garlic and cook until the onion softens, stirring while it is cooking. ~ Add drained and flaked salmon into the bowl with the potato. ~ Add onion mixture, as well as the lemon rind, parsley, coriander and one egg to the bowl. Using hands, mix the ingredients until well combined. ~ Shape the salmon mixture into eight patties, place on tray lined with baking paper. Cover and refrigerate for 30 minutes or longer. ~ Prepare ingredients for coating the cakes with breadcrumbs. Place flour on a plate, place lightly beaten egg in a shallow bowl, and place breadcrumbs on another plate. ~ Coat salmon patties one at a time. First coat the pattie in flour, shaking off the excess flour onto the plate, then dip in the egg and then coat in breadcrumbs. Place the crumbed salmon cakes back on the tray. ~ Heat one tablespoon of the oil in the frying pan used for the onion and garlic, cook patties until browned on both sides. Cook four at a time and drain on absorbent paper and cover with foil to keep them warm. 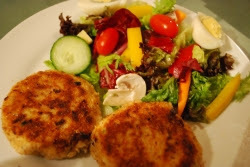 ~ Place salmon cakes on plates with a lovely summer salad and drizzle with sweet chili sauce or a dollop of sour cream with dill seasoning. Alternatively, you can put the chili or other sauce in a shallow dipping bowl. ~These are also great if you substitute tuna for the salmon.